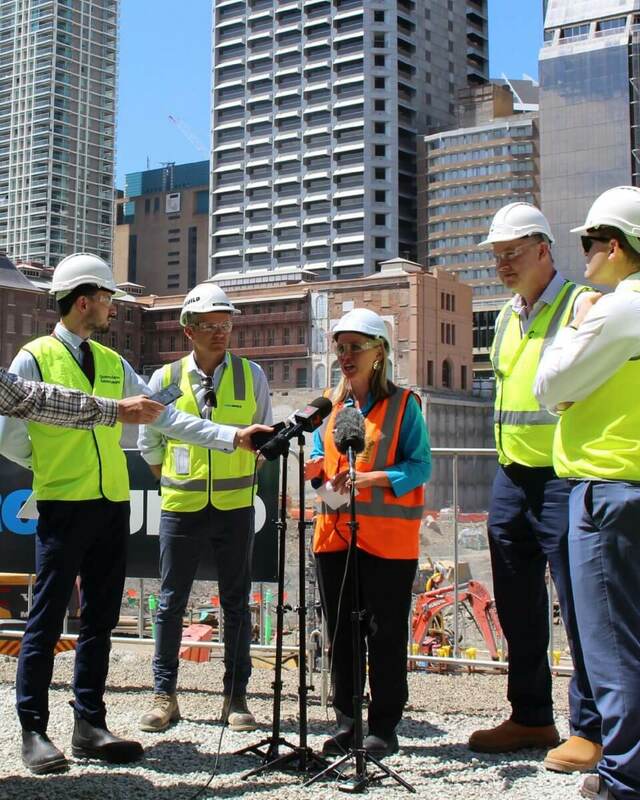 Brisbane CBD’s biggest hole in the ground has just hit the half way mark, with 225,000m3 of material removed from the precinct which will house the $3.6 billion Queen’s Wharf Brisbane Development. The earthworks, which began in March, are for a 26-metre deep, five-level car-park basement that will service the entertainment, dining and tourism development when it is due to open in 2022. “More than 90 per cent of the material is being recycled with most of it being used for reclamation works by Brisbane Airport. As part of the excavation, a 172-metre waterproof barrier wall was constructed while 2,300 rock anchors will hold the remaining perimeter in place. Meanwhile, piling to build the above-river Mangrove Walk is now complete, with work to fit pre-cast concrete platforms underway. A vibrant art piece has been applied to the underside of the Riverside Expressway at Waterline Park, and upgrades to the bikeway between the Goodwill Bridge and 1 William Street are expected to open in the second half of 2019. “Having reached half way, this next phase of excavation is where we expect to hit bedrock in early 2019,” Mr Crooks said. Queen’s Wharf Brisbane integrated resort development will provide over 12 football fields of public space, a 100m high sky deck with uninterrupted views of Brisbane and the introduction of four new hotel brands, including Brisbane’s first six-star hotel.